So said James T. Kirk, he of much maudlin sleeve-rippage in “The Naked Time,” upon discovering that the Enterprise was on its way back to November 5, 1955. Er, no. That was something else, something that I believe involved — of all the preposterous things — a stainless steel car. I, meanwhile, am taking my own separate trip back through time as I dust off the shocking number of Xbox 360 games that I never finished, never even played, or simply haven’t seen in a long while. Yes, the video game “holiday release cycle” is once again almost upon us, and we’ve got a slew of excellent titles bearing down on us, many of them pumped up to the usual extreme levels of hype-factor. There’s Uncharted 2: Among Thieves on the PS3, the sequel to what I still believe is that console’s best game. There’s Halo 3: ODST which just dropped from orbit — shocking! — yesterday, Need For Speed: Shift (possibly the first non-turgid NFS game in years), Forza Motorsport 3, Brutal Legend, Call of Duty: Modern Warfare 2…can I get a glass of water here? And I’m not even counting the stuff scheduled to drop early next year, or even the recent releases that I haven’t picked up, such as Wolfenstein, Dirt 2 and Batman: Arkham Asylum. It’s not that I’m poor — indeed, I was just paid for some sidework I performed during July and August — but that all of my money is earmarked for the restoration of a real car: our 1979 Trans Am. So, given that I must make hard choices governing my entertainment in the meantime, I’ve opted to put a select amount of money toward a select few games that I expect will bring me maximum enjoyment over a long period of time. To that end, I’ve already picked up The Beatles: Rock Band — its downloadable albums releasing over the next three months will no doubt keep me occupied over the long term. And I’ve already mentioned why Forza 3 makes sense for me. So, with my gaming fix for the remainder of 2009 already planned out, what am I doing to prevent jealousy from setting in as my daily browsing of gaming blogs inundates me with news about the spiffy new releases I’ll be passing up? For a start, I’ve decided that it’s time to deal with my overwhelming video game backlog problem — I’ve got so many games that I’ve completely fallen behind. There are titles on my shelf that I bought on sale or as part of a volume discount and have yet to even play. This very evening, then, I decided to start resolving this problem. Once upon a time, back in 1994, I went by the nickname “B.J. Blazkowicz.” (Since B.J. are already my initials anyway, this wasn’t too difficult.) B.J. Blazkowicz, the comic book-style protagonist of the classic Wolfenstein 3-D, was one of my favorite gaming heroes — and Wolfenstein was and is one of my favorite games, period. Nowadays, the newest title in the Wolfenstein franchise — titled simply Wolfenstein; how daring — is on store shelves, and it’s the first game in the series that’s been designed from the ground-up for consoles, rather than PCs. I was going to pass up this new Wolfenstein — yes, me, a certified Nazi-blasting, Hitler-skewering, chaingun-wielding maniac. Frankly, the game didn’t look all that compelling. The graphics were competent but somewhat dated, the story seemed like a 50% retread of 2001’s Return to Castle Wolfenstein, and let’s face it, there are so many other great games on the radar right now that spending $60 on anything but an AAA title seems foolish. But today I noticed that a free playable demo of Wolfenstein had just landed on Xbox Live Marketplace, so I decided to give it a shot. The game’s weapons are rendered with loving detail, firearm action is superb and realism is present and accounted for. It somehow makes firing a bolt-action Kar 98 fun in an arcade-style setting. The graphics are a little dated in some areas, but overall are more impressive than the screenshots and marketing previously led me to believe. While not much different from previous Wolf games — or even IPs like Indiana Jones, for example — the curious mix of Nazis and paranormal shenanigans is always entertaining, and the game’s story looks to set up a good occult mystery. The “Black Market” concept of upgrading your weapons seems like a great idea and works well in practice. Finally B.J. has somewhere to spend all of that gold and treasure he’s always looting! Voice acting was fairly cheesy, especially the designers’ inexplicable decision to record voiceover of the written intelligence logs you find lying around. When I pick up a classified Nazi report, I don’t expect an over-the-top, faked up voice to start reading it to me. Didn’t like this at all. Your allies tend to repeat the same phrases over and over, reminding me of the godawul latter levels of Half-Life 2. The Germans still don’t speak German. I know, it’s a design decision and a minor point, but it always bothered me. One of the great things about the original Wolfenstein 3-D was all of the hilarious German lingo the enemies would belt out as you opened fire on them, even if most of it was grammatically incorrect. The “veil” powers, one of the game’s central themes, seem almost a little too convenient. They also weren’t explained at all in the demo–B.J. even seems to have acquired them before the game even begins, if the opening cutscene is any indication. Even though the full game may exposit on these powers more appropriately, I found myself wanting more of this from the demo itself. Overall, I’d say the demo of Wolfenstein raised my opinion of the game somewhat. If I had the money for one more game lying around, I honestly would probably pick this one over Halo 3: ODST. But as it stands, I’ll be waiting until a price drop or two (or perhaps a good weekend sale) have taken a bite out of that $60 tag. 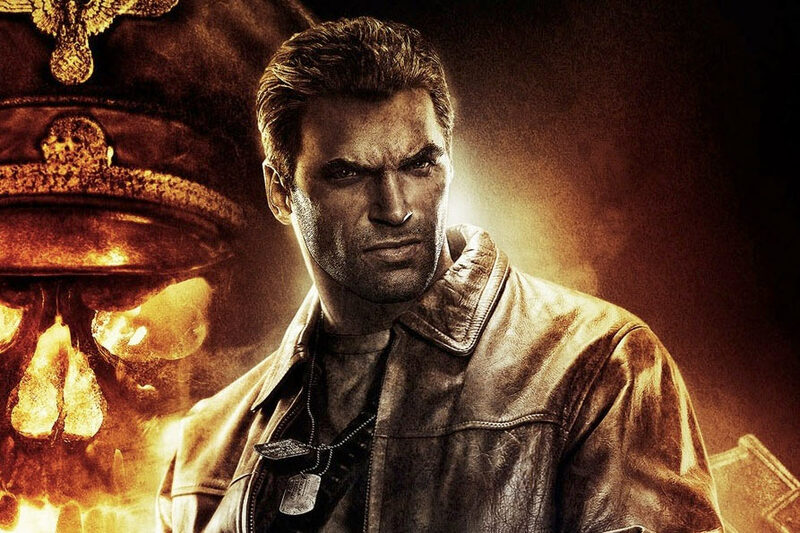 With my all-too-brief tour of Nazi Germany out of the way, I decided to dip into the Xbox archives and revisit some of the games that I just didn’t pay enough attention to before. My first selection was Square Enix’s Project Sylpheed, an arcade-style space combat sim that I last talked about two whole years ago (shortly before my first Xbox collapsed and died of terminal RRoD, as it happens). That October, whilst on our road trip to Michigan, I located a used copy of Sylpheed in a local Gamestop and picked it up. It’s been sitting on my shelf collecting dust ever since. Despite its use of some of anime’s worst cliches, Project Sylpheed also uses some of the things I love about anime, and sci-fi anime in particular: The design styles, the high-tech futurism and technobabble, the heroic and epic battles. I plan to come back and play some more of this. Sylpheed isn’t the only game that’s languishing on my shelf, in desperate need of some Xbox drive time. I also never bothered to finish Bioshock, and I think it’s high time I went back to that celebrated “New Classic” (is this AMC network?) for a family reunion. Although I could continue where I left off, it’s been literally years since I picked that game up, so I’m more likely to start a new game from the beginning and see what goes. I’ve pretty much forgotten everything, anyhow, so doing otherwise might land me in a spot of trouble. With Bioshock’s sequel set to arrive sometime early next year, it seems like now would be an appropriate time to revisit — and finish, finally — the first game bearing its moniker. Other classics that I never finished? Half-Life 2 Episodes 1 and 2, both of which are included in The Orange Box for Xbox 360, which I own and, again, haven’t touched in eons. While I finished the main game, I never dug into either of the two follow-up episodes, so that’s a must as well. And then there’s Project Origin, which I need to wrap up, and Burnout Paradise, and Tomb Raider Anniversary, and on and on. In other words, despite my purchasing only a small selection of the new games coming out this season, it looks like I’ll have plenty of things to play. Now if you’ll excuse me, I’m going to bed. And Captain Kirk has three days to live over again.